Have you ever wondered what makes your system bleep that irritating ‘low storage’ alert more often than not? Your general reaction would perhaps be ‘Those darned games and apps. They use too much space’. But think again. Is it really the games and apps that waste your phone’s storage capacity? Trust us when we tell you the answer is ‘NO’. Sure they take up space but that’s hardly the cause for blaming them for your storage woes! Most of the apps on your phone make life easy and c’mon who doesn’t like good game! So who are the real culprits then? File copies. And loads of them! Every time you receive or share a photo via Whatsapp or Facebook you are creating copies. Every time you are downloading music and audio clips, you are creating duplicates. When you upload a photo on Instagram from your gallery you are gain creating redundant copies! And there are hundred other ways in which you keep misusing your storage. And getting rid of all such duplicate files is not as easy as you would think. 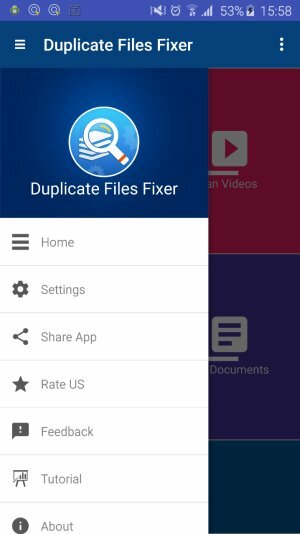 Duplicate Files Fixer or DFF is a duplicate file finder that lets you locate and do away with redundant file copies. It’s a super-efficient app that retrieves storage space on your Android by identifying similar files, which you can duly delete. So here’s how this duplicate media remover app works. The first thing that will strike you about Duplicate Files Fixer is its UI. The moment you launch the app, the screen will give you 5 distinct scanning options: Scan Audio, Scan Videos, Scan Pictures, Scan Documents and Full Scan. So you can either run a partial scan or a full scan for all file types. Once you have chosen your desired action, DFF will run a quick scan and identify the duplicate files for you in a matter of seconds. The screen will display all such files. You can unmark the ones that you don’t want to delete. The app will ask you grant permission to access the source location of the files you want removed. However, it needs to be mentioned that the app doesn’t locate the original file(s). It only functions as a duplicate file finder. So in case you want to remove a certain file completely, DFF won’t be of help. DFF has a rather high average rating on Google Play store: 4.5 and it indeed does what it promises to do. Removing garbage from your device and retrieve much needed storage space for you. The fact that it gives you the option to run categorized as well as full scans increases its utility quotient. The app has also been updated to read SD Cards on devices powered by Android M. That means now it can identify duplicates on both internal and external memory. All in all, it’s pretty handy app to have on your phone. After all, more the storage, better the phone performance.